Have you ever picked up a book, read it for a few days, put it down for a few weeks, then picked it up again and read it for a few more days before repeating this cycle? Well, that’s the history of my attempts at reading J. R. R. Tolkien’s The Return of the Shadow, one of the History of Middle-Earth series that was edited and formed by Tolkien’s son, Christopher Tolkien. And that’s not a criticism of the novel or its contents, but rather a commentary on what one needs to be prepared for when picking up this book and reading it. This is not a book that is for the timid reader or the passive reader. The Return of the Shadow is the type of book that you need to actively read – similar to how a collegiate English Literature student would read a novel in preparation for creating a critical analysis of the material. I admit that when I started reading this book, I was not ready for that level of active participation in what was in front of me. In fact, I stopped and started this book over the course of several years, but finished the last 168 pages just recently in the last few days. Putting my own, initially incorrect approach to reading this book aside, if you are looking for a deep, highly detailed dive into the formation of Tolkien’s Middle-Earth, then this is it. The Return of the Shadow brings you to the very first drafts of The Lord of the Rings – to a world where the familiar foursome of hobbits that are the stars of the trilogy are not Frodo, Sam, Merry, and Pippin. Instead, the reader is treated to Faramond, Frodo, Merry, Odo, Folco, and a host of other hobbits that never made their way into starring roles in the final trilogy. 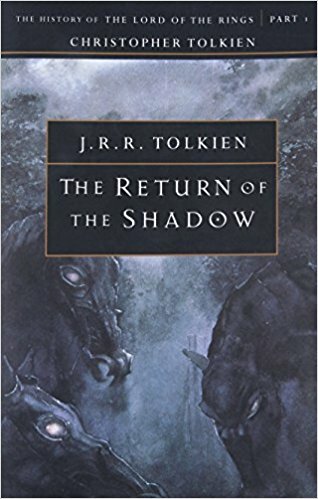 The Return of the Shadow also takes its readers into the thought process behind Tolkien’s creation of iconic characters like Treebeard and Strider. Would you believe that in their first incarnations these well-known players in The Lord of the Rings were much different? For example, in Tolkien’s first draft, Treebeard was working in the service of Sauron. And Strider? He began as the hobbit Peregrin! And these characters are set in a Middle-Earth that includes a forgotten elvish land named Hollin, a Rohan that is still filled with horse lords – but whom are also working in the service of Sauron, and where Gondor is known as Ond. As fascinating as this early version of Middle-Earth may sound, there are some aspects of The Return of the Shadow that were a bit much for this reader. For example, in his writing and analysis of his father’s work, Christopher Tolkien often repeats words and phrases regarding the story that become more and more laborious as you go along. Also, in some cases he beats a dead horse to the point of absurdity. At one point at the beginning of the third phase of this book, Christopher Tolkien revealed that Odo was no longer going to be part of traveling group and that he would be replaced by Frodo. However, he repeats this revelation three or four times within two or three pages. For someone who gets the point the first time, you do not need to have the same information repeated to you several more times within the span of a few pages. All things considered, I am glad to have read The Return of the Shadow. While it is an incredibly dense book and while it sometimes dives too deeply for my liking, it is truly a novel that captures the impressive scope and wide-ranging depth of not just Tolkien’s Middle-Earth, but the variety of fascinating characters that live within it. If there is a Lord of the Rings fan in your house or in your family and you want to get them a book that they can get lost in for hours, then this book would make the perfect gift. Much credit should be given to Christopher Tolkien, the son of legendary fantasy author J.R.R. Tolkien. Not only must it be hard to carry that name after the wildly successful Lord of the Rings movies that earned a fantasy movie the Academy Award for Best Picture for the first time in history, but the legacy that comes with the name means that one must be a master of his father’s material. To this end, Christopher has become the world’s foremost expert on Middle-Earth – the mythical land of elves, dwarves, hobbits, and men that his father used as a setting for his major works. Though the most popular of these works was the Lords of the Rings trilogy and Bilbo Baggins’ tale in The Hobbit, the elder Tolkien also began writing other stories concerning the peoples and histories of Middle-Earth. Some of these stories have been published as The Silmarillion while others were either in The Book of Lost Tales or Unfinished Stories. As these books entered into circulation, Tolkien fans always craved more and fuller stories. Thanks to the hard work of Christopher Tolkien, The Children of Hurin is the first new Tolkien story published since his death. To be clear, this is a complete, 259-page story and not a lost tale or unfinished item. Christopher does a great job of telling the reader how he was able to put together the new story from his father’s notes and letters, so you can read that when you purchase the book. I, for one, was pleased with the story in the book. Before reading it, one has to understand that this is a book that was, in fact, pieced together by notes and large swatches of unfinished parts of the tale. Christopher does a masterful job of putting together a full flowing story from these materials. Hurin, one of the great heroes of men, is essentially captured by the Dark Lord and forced to watch the destruction of his family from on top of the his fortress. The title of the book refers mainly to Turin, who is Hurin’s son, and his rise from a boy to a fierce and intelligent warrior. Nienor, Hurin’s daughter, also plays a very important dually motivated role in the book as her fate is intertwined with her brother. As the Dark Lord put Hurin on top of his fortress, he cursed his entire family – a curse which is easy to see throughout the entire book and comes to an emotional end in the last paragraph or two of the story. The writing style isn’t easily critiqued given that Tolkien did not have a chance to proofread his manuscript before putting it out for mass consumption. However, the story does flow and there are few, if any, breaks in the storyline. One thing that the reader should be ready for is the speaking style of the characters. Many of the characters speak in a foretelling tone and what they predict generally comes true. So as you read, you’re finding out what will happen in the next paragraph or the next chapter throughout the entire book. It’s not really a distraction if you’re a Tolkien fan, but it may take some getting used to for new readers. I obviously give this book my highest recommendation. Not only am I a Tolkien fan, but I am one of the fans who have been craving something more since I finished reading the Lord of the Rings (a trilogy which I usually read annually). So, if you’re looking for a good read regarding the early history of Middle-Earth, the The Children of Hurin is for you.